Subscribe to Win a Basket of Sourdough Breads! Win a basket of freshly baked sourdough bread from Orford’s own award winning bakery! The Pump Street Bakery have just launched a new recipe sourdough which we are excited to share with you! It is a crusty loaf with a very moist, open crumb. 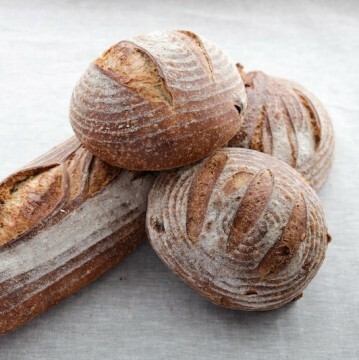 The bread box we are offering as a prize contains four of their best-selling sourdough loaves; a long WhiteSourdough, a round Brown Sourdough, a Walnut and Sour Cherry and a 40% Rye. The bread is baked for overnight delivery on Thursday afternoons so that it gets to you as fresh as possible on Friday. The next draw for the breadbasket is 1 November 2016. Anyone who signs up for our newsletter or likes us on Facebook or retweets our posts will be entered into the next available prize draw. 1. This prize draw is open to all UK and Republic of Ireland residents aged 18 years or over. 2. The draw is free to enter, and anyone who subscribes to our newsletter or likes us on Facebook will be entered into the next draw, date of which is advertised on our website. 3. Only one entry per person is permitted. 4. The prize is a bread basket of four loaves of sourdough bread purchased from the Pump Street Bakery in Orford, Suffolk. 6. Keep Cottage can accept no responsibility for, and reserves the right to refuse, entries, which are corrupt, incomplete, lost or damaged. 7. In the event of any dispute regarding the prize draw, the decision of the owner of Keep Cottage shall be binding and no correspondence or discussion shall be entered into. 9. The prize winner will be selected at random on 1 September 2016 from all the entries received by the closing date and the winner will be notified by phone, email or letter within7 days from the date of the draw. The prize draw will be supervised by an independent person. 10. The prize will be sent to the address supplied to keep Cottage by the winner. If a winner does not claim a prize within 28 days of being notified, or if a winner is not available to take up the prize, Keep Cottage reserves the right to award the prize to another entrant without liability to the winner. 11. Keep Cottage reserves the right to publish the winner’s name on the Keep Cottage website and via Social Media channels. 12. Entry into the draw will be deemed to constitute acceptance of these terms and conditions. 13.These rules are governed by English law and subject to the exclusive jurisdiction of the English Courts.